Wireless systems for transmitting sound are a good choice for those who need to electronically boost their voice (or instrument) while retaining the ability to move about freely. Wireless sound technology is also used for wireless in-ear monitors, which are headphones connected to a received the musician has attached to himself. Thanks to this, the player isn't disrupted by the noise on stage and needn't stand by the stage monitor. Wherever the musician moves on stage, they always have a stable in-ear monitor of what they are playing and what other chosen instruments are playing. If you're looking for a reliable solution for the wireless transmission of your voice, we recommend a standard wireless set with a handheld microphone. The set includes a microphone and a receiver, giving you everything you need. Our experts are ready to answer any questions and to recommend the ideal solution for your wireless system. You can call us at 020 8089 1481 (Mon - Fri, 9 a.m. - 5 p.m.) or send us your questions by email to . The vast majority of today's wireless systems function in these frequency bands: UHF, VHF, UHF DAP, 2.4 GHz or 1.9 GHz. Wireless in-ear monitors are reversed – the musician has the receiver, not the transmitter. 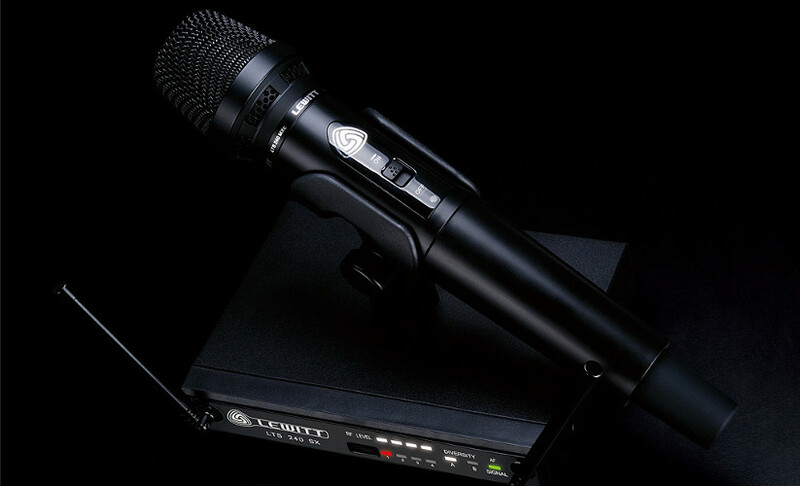 Wireless handheld microphones are probably the best-known type of wireless sound technology. They are mainly ideal for singers who don't need to have both hands free but want to be able to move about freely. A wireless headset microphone is attached right in front of the singer's mouth, allowing them to have both hands free without having to worry about the microphone. This advantage makes headset microphones popular in musicals. Clip microphones are designed to be attached to the musician's clothing (at the chest), making them more suitable for spoken word than singing. Wireless clip microphones are used especially by emcees, conference leaders, actors, managers at company meetings, etc. As the name suggests, this system is designed for all musicians who want to enjoy completely free movement over the stage with their guitar or bass guitar. Wireless reporting sets represent a category of mobile wireless sound systems. These systems are especially useful in the field when no electricity is available. Wireless reporting sets also allow simple work with a camera. Wireless monitoring straight to the ears is an increasingly popular way to handle control monitoring. Wireless in-ear monitoring is being used by more and more professional musicians. This practical technology allows musicians to hear in high quality exactly what they want to hear without disturbing other band members. Please note that the separate parts of wireless systems can often be purchased separately.